For those looking to snag that elusive first coding position, experts suggest focusing on everything from the right academic mix to sound résumé building. Learn the details behind the Target, Probe, and Educate effort, which can make life miserable for organizations suspected of failing to meet Medicare criteria. More powerful than HIPAA, the European Union’s General Data Protection Regulation may have an effect on these shores. To simplify documentation processes, a Hawaii health system took a radical in-house approach—it listened to staff. Audits that rely on random samplings aren’t enough to ensure a health care organization’s coding processes are in good shape. Thanks to the partial government shutdown, it may have seemed like nothing was getting done in Washington, but several agencies managed to squeeze in some action around the inaction. Skilled nursing facilities are set to take on the challenge of the new patient-driven payment model. Understanding the distinctions between patient monitoring and continuous clinical surveillance is more than a matter of language. 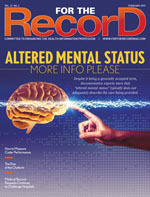 Despite “altered mental status” being a generally accepted term throughout the medical profession, documentation experts warn that it typically does not adequately describe the care being provided. When researchers checked in on the release of information process at 83 top-ranked hospitals, the results were not encouraging. No, it’s not the title of the latest science fiction thriller to hit the big screen. Rather, it’s an examination of how the conversational agents fit into the world of health care. 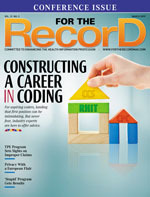 Dashboards and EHRs have made it easier to track coder productivity, but a discerning eye is still required to ensure the data are painting an accurate picture. Telehealth platforms and wearable sensors are two of five technologies leading the charge to improve patient care. Predictive analytics is going beyond the exam room and into the revenue cycle, flagging troublesome billing problems and helping health care organizations understand operational issues. When a medical device adverse event occurs, coders must consider whether to code it as device failure or complication due to a postoperative condition. One of the most rewarding aspects of being a seasoned HIM professional is the opportunity to pass along knowledge to those looking to get their careers off the ground. An eye-opening study spotlights the risks of choosing a coding partner that sends work offshore. The standard may hold the key to dousing fears about health care's ability to seamlessly transfer clinical data. A RAND Corporation study found that a multiprong strategy may help put a dent in health care's long-standing problem. It may be 2019, but the health care industry continues to hang onto the beloved fax machine, a bygone technology whose time may be short if the Centers for Medicare & Medicaid Services has its way. The time it takes health care organizations to detect data breaches continues to decline, but it still is not ideal. To achieve proper reimbursement, learn the ins and outs of reporting shared/split visits. A survey on charge capture practices reveals several interesting tidbits on the role of coders. A colorful infographic helps to illustrate the five stages of data quality maturity. 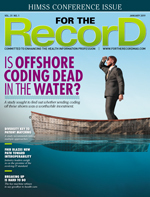 To avoid becoming vulnerable to malpractice claims, physicians must use EHR technology as it was intended.